Each of us wants our wedding day to be memorable, to have a theme to it, to stand out in every possible way– and why not? This of all is the days in our lives, we'd like to remember and hold dear. 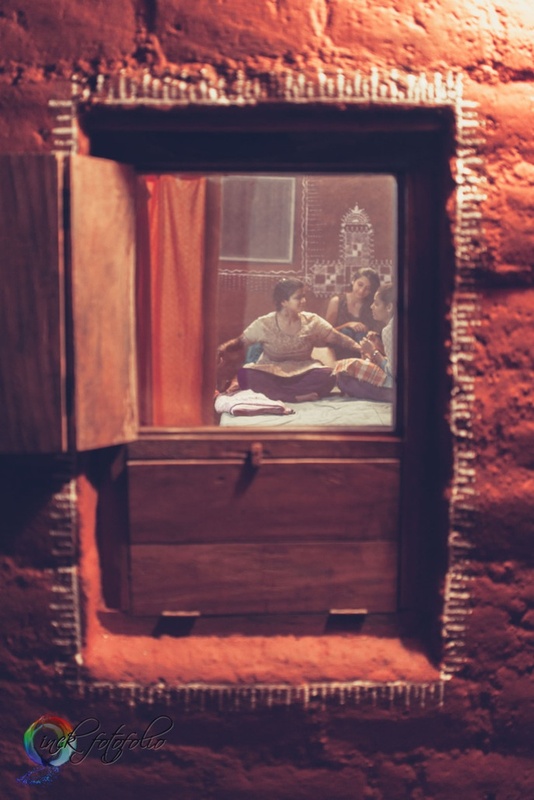 Some of us decide on theme weddings based on our favourite colours, a particular destination or on the movies we love (how amazing would a Yeh Jawani Hai Dewaani themed wedding be?). 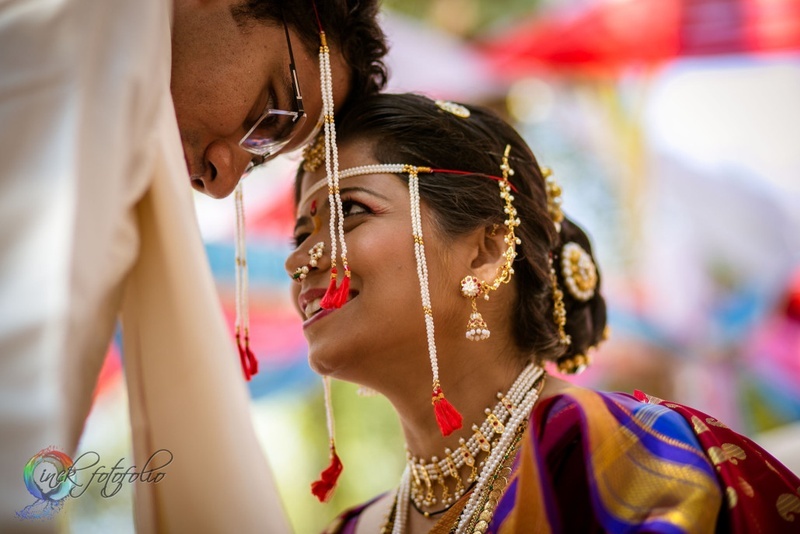 Theme weddings make the memories one hundred times more special because they speak of taste and personality. 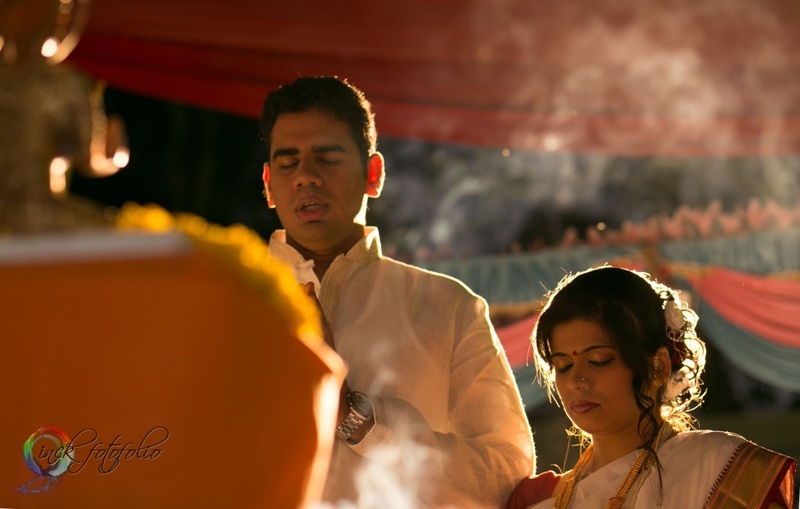 One such wedding was the union of Pradnya and Mayur, unique, memorable and inspirational! Have fun! 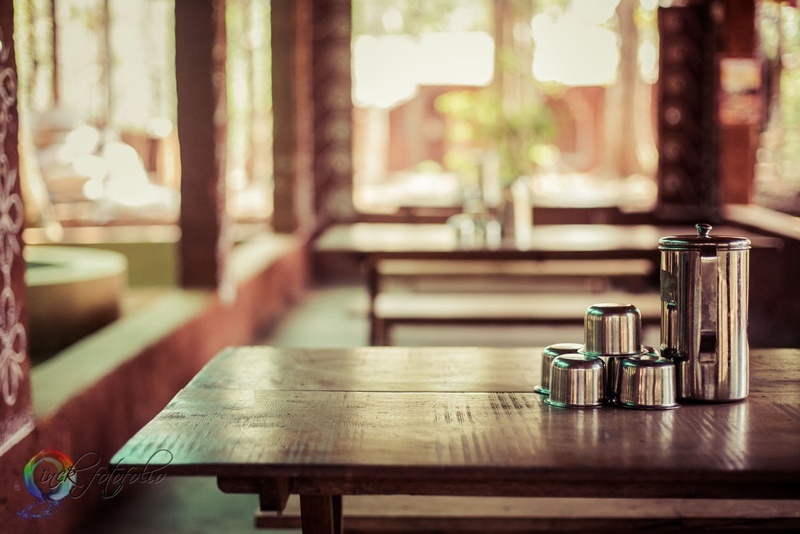 Take a break – have some more fun. Take another break! 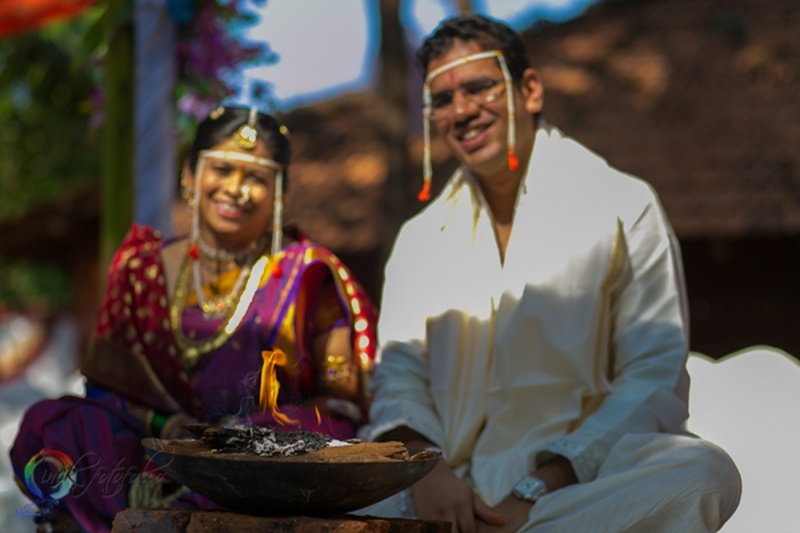 This one line pretty much sums up this beautiful couple’s destination wedding held in the Konkan. 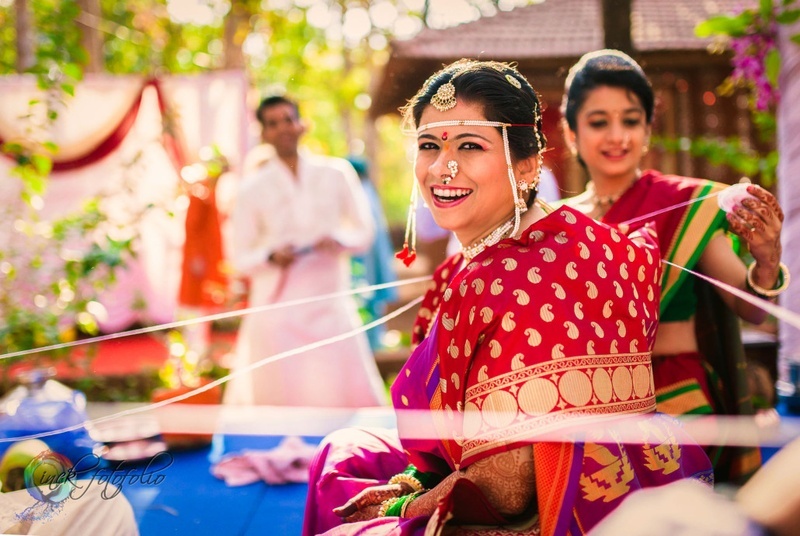 Pradnya wanted to plan a wedding, away from the hustle and bustle of the city, and what better location than the rustic green belt of Konkan. 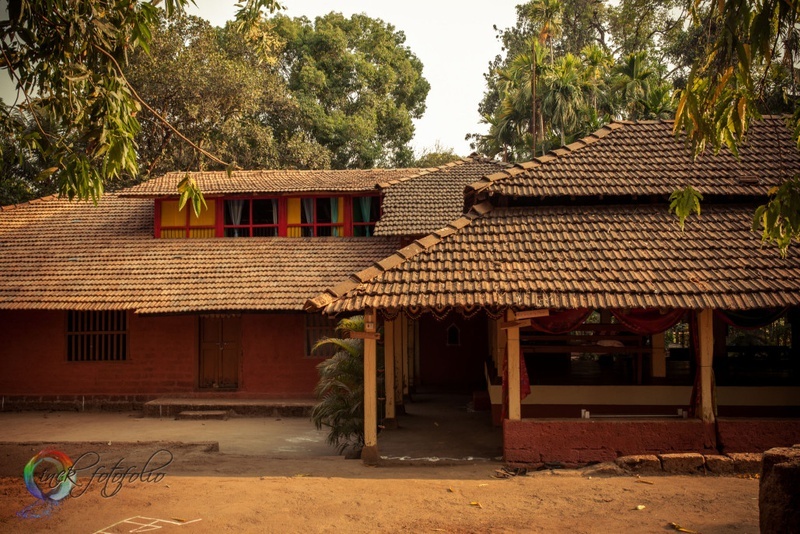 The venue was a heritage eco-resort, popularly known as Mamach Ghar, set in a cosy little place called Tural. 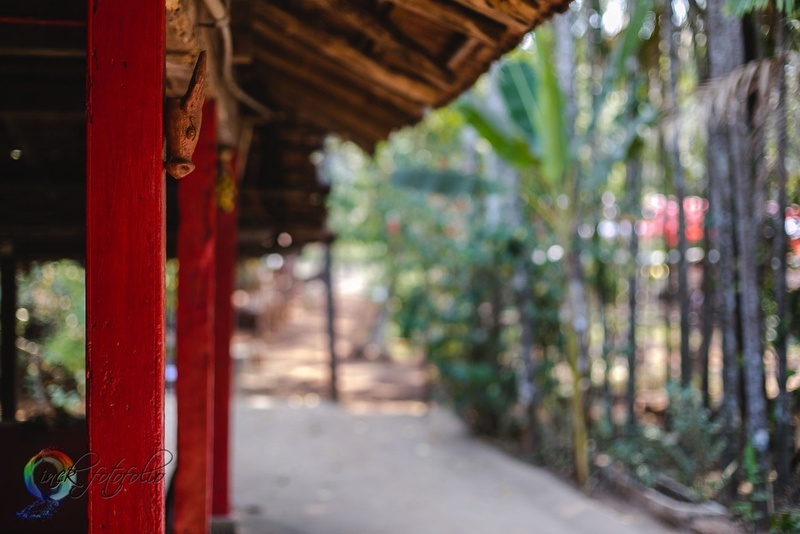 A terracotta tiled roof, adobe and geru walls, red painted wooden posts and ranch style architecture set this wedding venue apart from any other we've seen so far. Hearing this, Pravin from Scarlet Weddings was already sold. 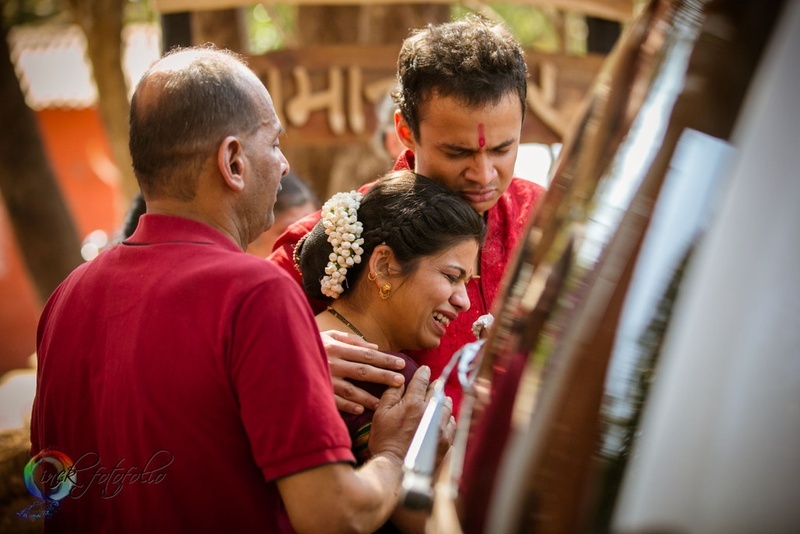 He was 200% sure he was going to shoot this wedding – come what may! The scenic drive to the resort in Konkan set their expectations as high as the beautiful sky. And boy, nature never disappoints. 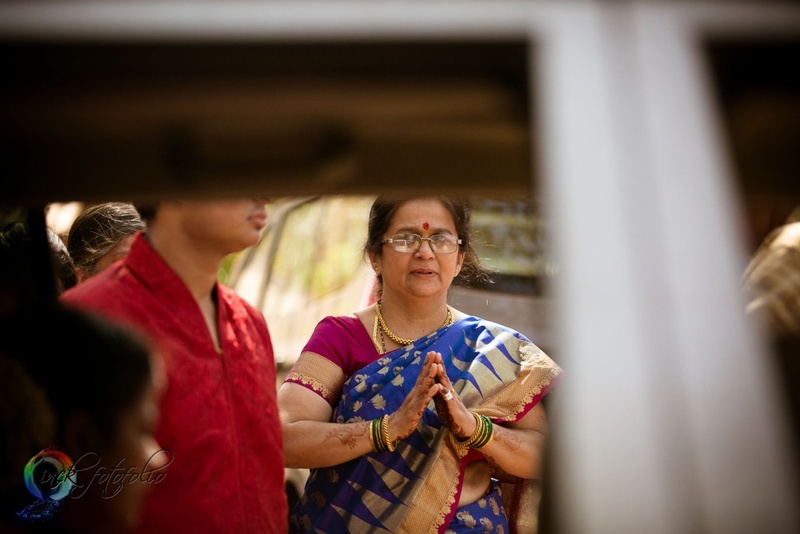 The lush green trees, the fresh air and clear blue skies welcomed them as they entered the serene space of Mamach Ghar. 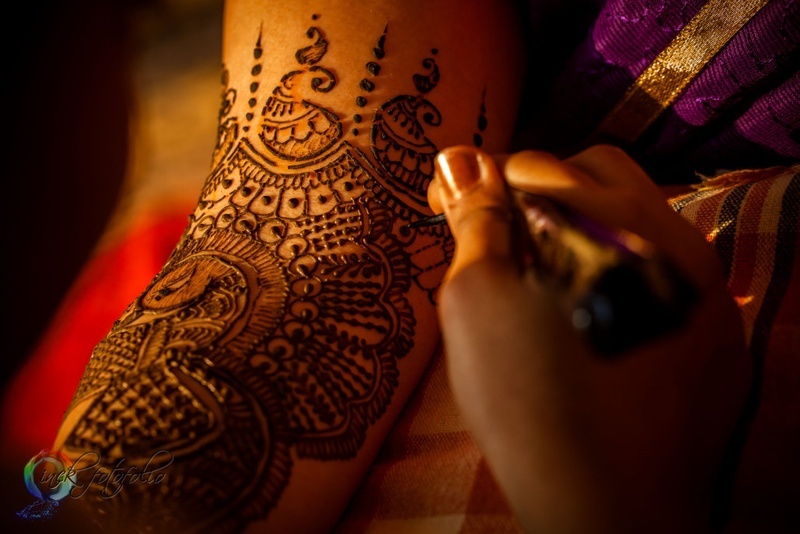 The Mehendi ceremony was all things dreamy! No, it didn’t have blazing yellows and pinks or even bright cabanas. 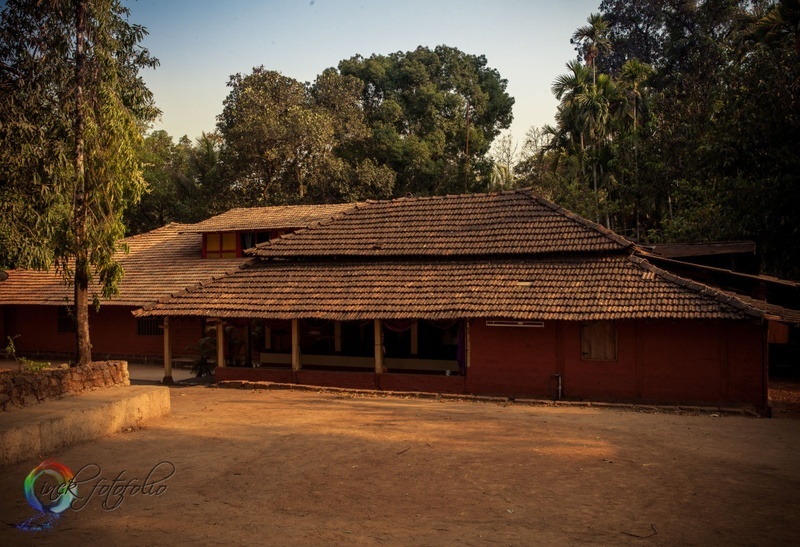 It took place with an audience of ten people under a mango tree just behind a rustic cabin, with the majestic setting sun as a backdrop. Isn’t this exactly what dreams are made of? We would’ve given anything to be at this intimate countryside wedding! 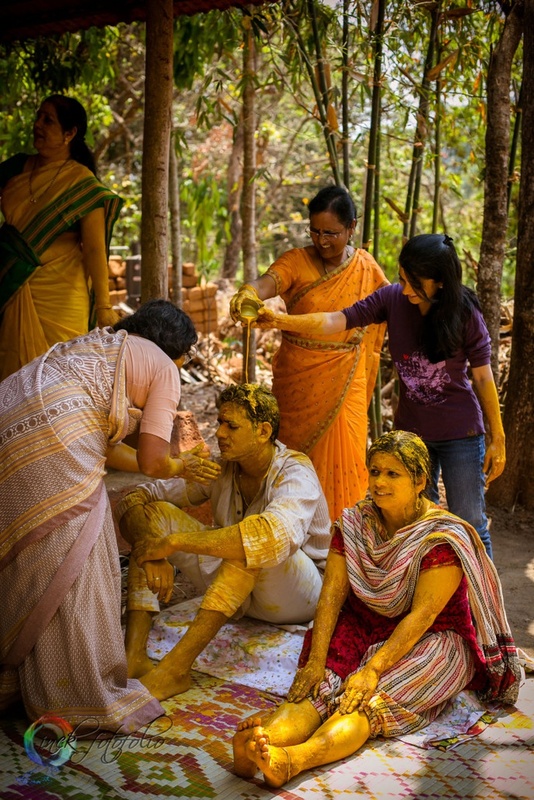 The next morning, The family celebrated Holi. No, it wasn't holi that morning. 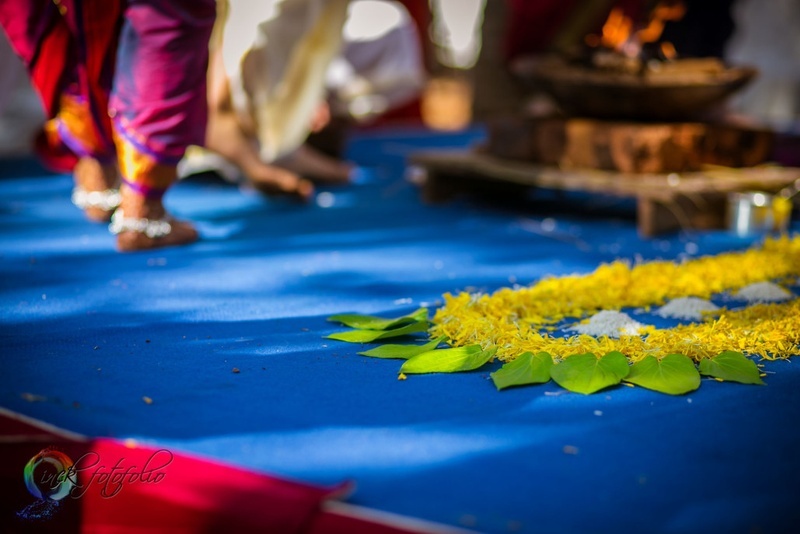 It was the Haldi ceremony. And what a way to make it super fun, interactive and alive. 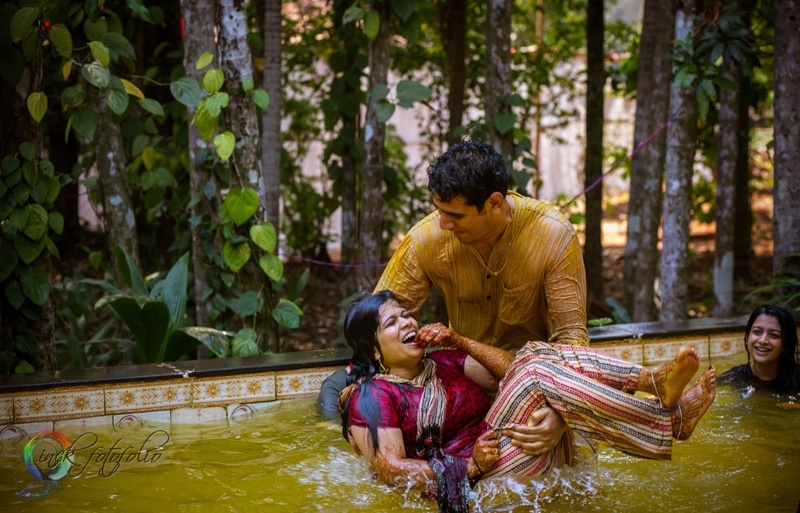 The couple was drenched from head to toe – clothes, hair and all! 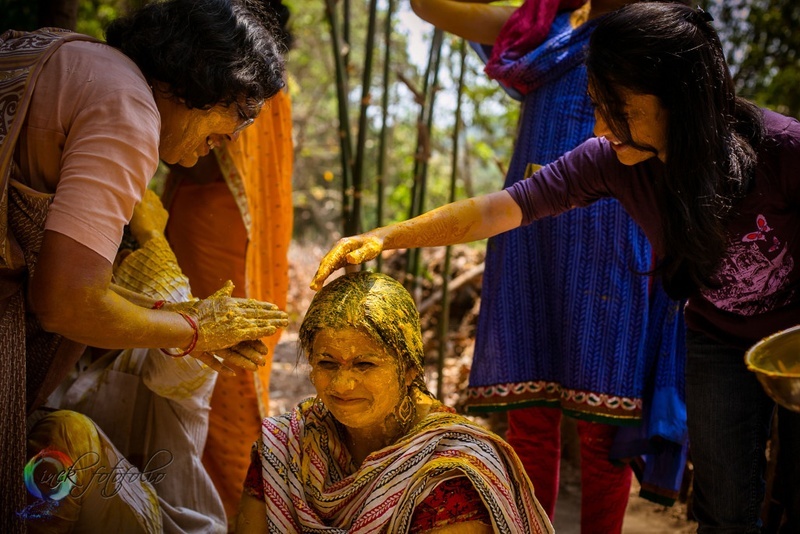 Calling it a Haldi ceremony would be an understatement (the pictures are proof!) 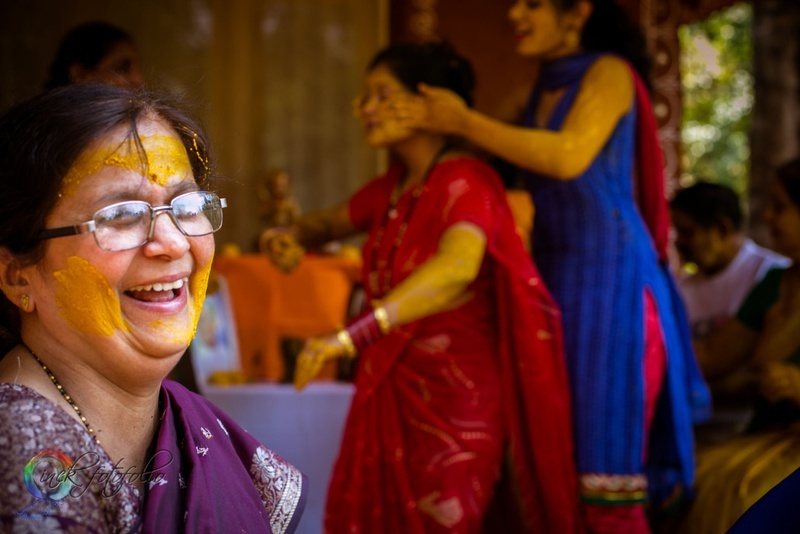 The explosion of yellow, amidst the exuberant greenery of Konkan, with the two most fun families loving every moment spent with each other, was a perfect setting to be in. 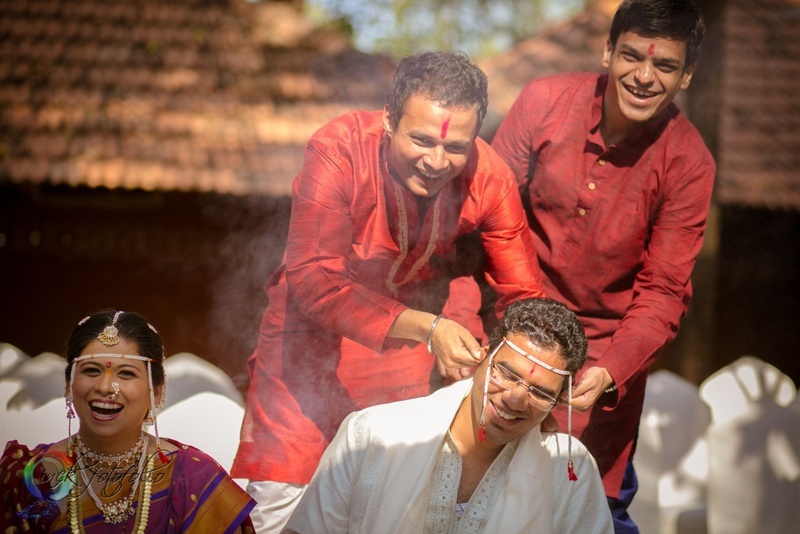 What began as the Haldi ceremony before the nuptials, ended up being a community splash in the small pool, where Mayur showed us his true colours! 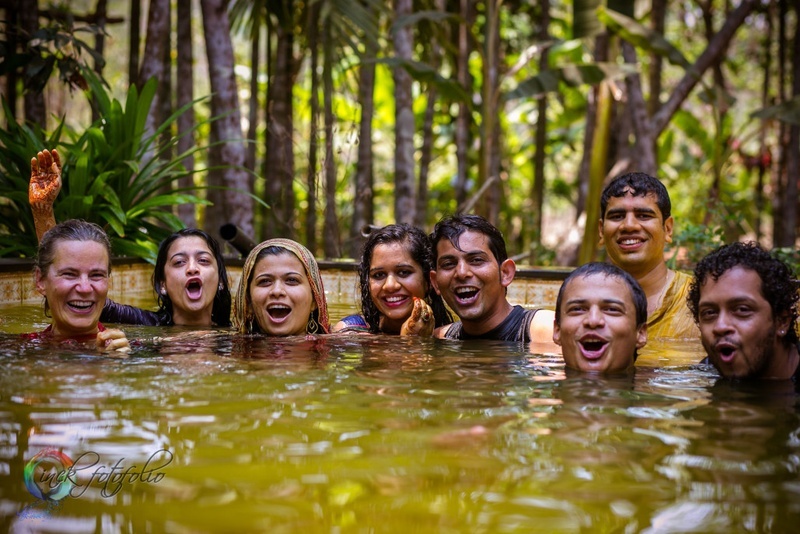 After being submerged in this holy paste, this couple along with their closest friends took a dip, washed it all off and emerged glowing and resplendent. 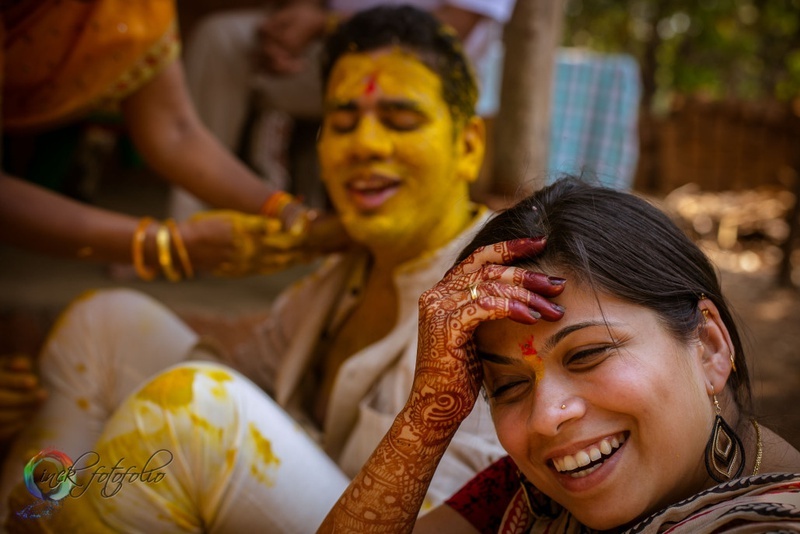 Haldi yes of course, but what added to the glow on their faces was the happiness, the joy, the love and togetherness. 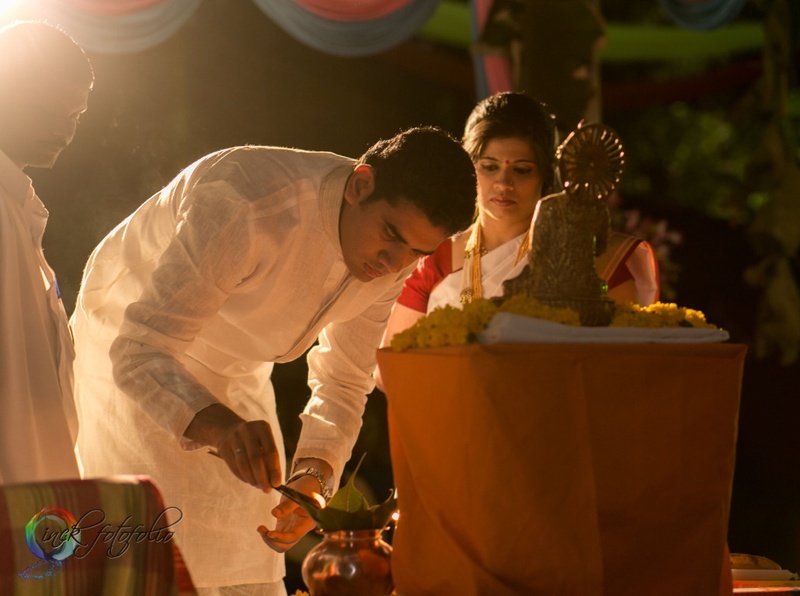 Pradnya and Mayur decided to tie the knot in a simple Buddhist wedding ceremony conducted in the evening. 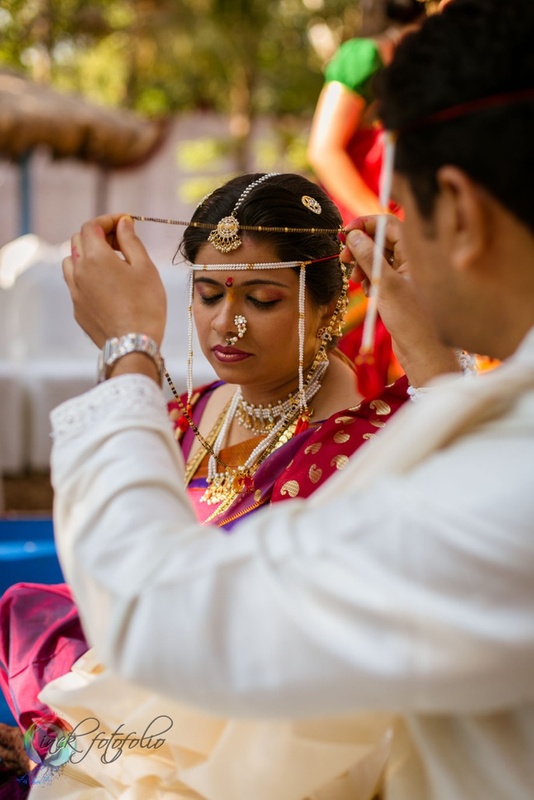 Draped in an offwhite silk sari with a red woven border and hair in a bridal updo, Pradnya's look complemented the calmness and serenity of the location and the ceremony itself. 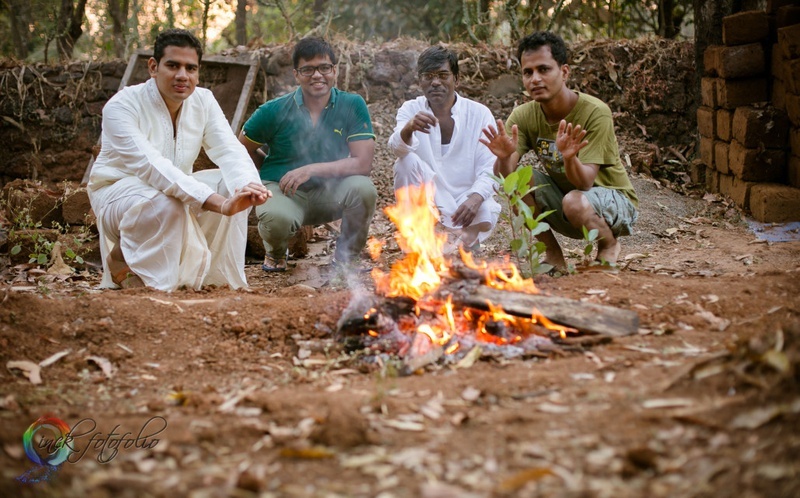 Mayur followed suit in a simple white kurta pyjama. 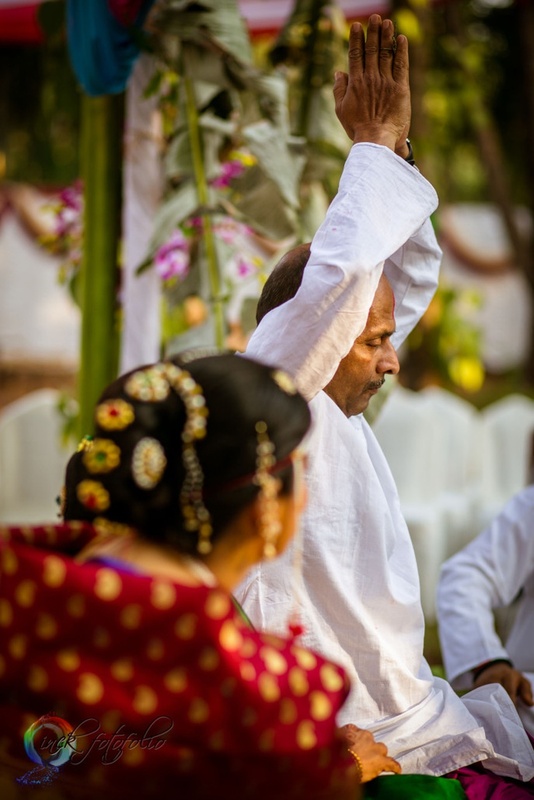 The wedding party reveled, danced and celebrated into the night. 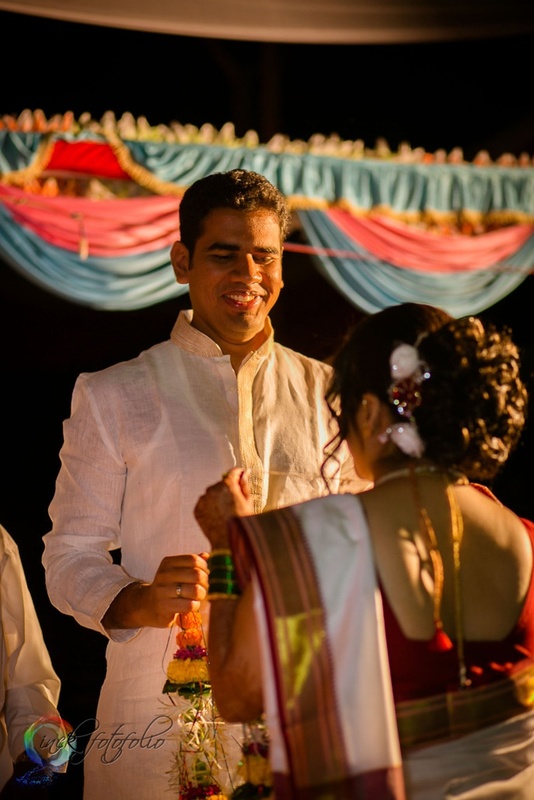 In a time when millions are spent on lighting, decor, food, Mayur and Pradnya chose to have nature do all the talking at their memorable and inspiring wedding ceremony. They truly spearhead the ‘Green Wedding Movement’. A humble, earthy wedding ceremony that proves that nature's grandeur can put any glamorous wedding decor to shame. 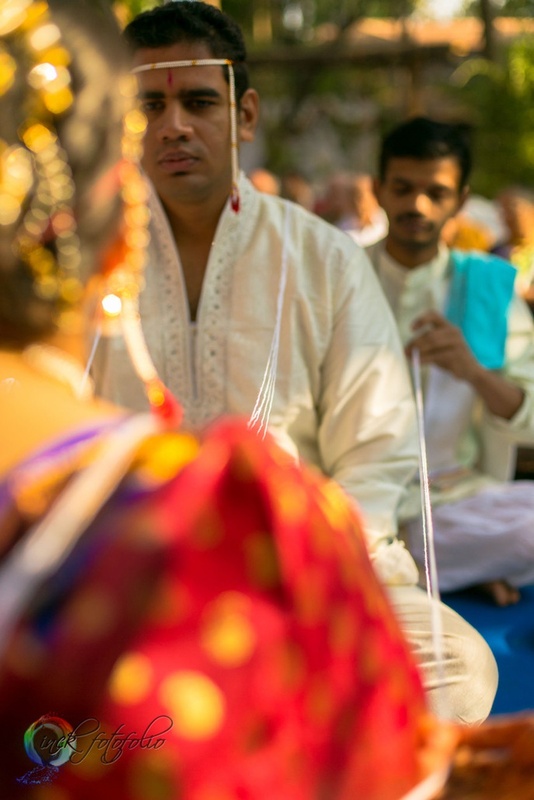 At Pradnya and Mayur's wedding, no one checked Instagram or grumbled about being in a no-connectivity zone. The setting made that unnecessary and irrelevant - all they focused on was the love!